Travis: How to configure Symfony to cooperation? You are happy user of the Symfony framework, and you heard something about Travis than you decide to test it. In this article, I describe how to connect popular tests’ tools (PHPUnit, phpspec, Behat) to Travis, when you have Symfony on your backend. 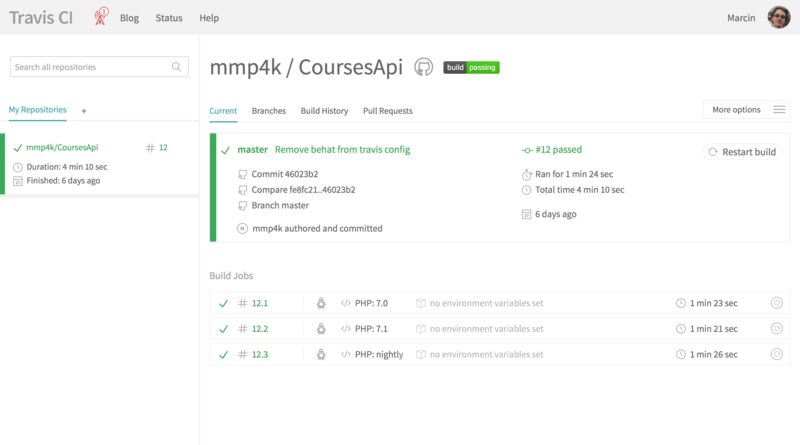 Before, we started configuring Symfony for supporting Travis you should know what is Continuous Integration and why that idea is very useful. In simple words, Continuous Integration is when your code is merged with master branch and tested a few times of a day automatically. In previous ages, programmer deployed application once, maybe twice a year, now we can publish our changes in minutes to a production server, and millions of users can start using it immediately. 1 Travis – what is it? Travis – what is it? You can configure it for running test application and deploy it to production, stage servers on Amazon (AWS S3) or Heroku. In this article, I will focus on configuration for automation tests. As you see it is regular YAML file with three parameters. language declares language that you can use. php tells Travis with that version of php you want to test your app. install list of commands that Travis has to run before run tests. Before you start you have to add that following line to your .travis.yml. There we will declare command to run particular test’s framework. Below you have lines which you need to add to .travis.yml then you want to add some test framework to Travis. Of course, you have to install each framework in your project before you configure Travis to work with it. That looks dashboard for each repository which you connect to travis.